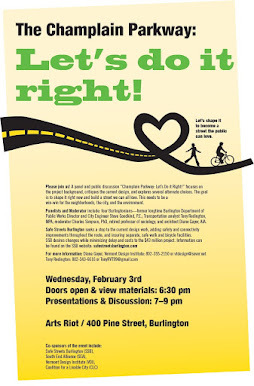 There follows a number of concepts, cross section alternatives, and areas to seriously explore based on the Winooski Corridor Study advisory committee meeting last week, some discussions with residents and business owners north of Pearl along the corridor and the comment by a consultant team member regarding sidewalk level cycle track. This thoughts almost all directly apply and show why the Champlain Parkway current design is obsolete and environmental document dating a decade ago is no longer valid. “Equality street” is the fundamental principle to be followed—highest level of safety and service for walk, bike, and vehicle modes. If retaining parking in a re-design results in significant extra costs to retain a bicycle facility (cycle track, bikeway, etc. ), sidewalk and some green strip, then those costs are ascribable to parking as it is an expenditure required to enable parking, not the bike transportation facility. One of the key benefits of a single lane roundabout in a narrow urban intersection (or converting to a roundabout) is the fact that roundabouts on all approaches require no turn lanes and generally move crosswalks about a car length away from the vehicle traffic area—this results in documented gains of considerable space which can be allocated to green space, adjacent business space, pedestrian space, accommodation of bicyclists, and even, yes, parking spaces. (Keck Circle in Montpelier freed up space, once used for a turn lane, on the adjacent Worcester Branch Bridge, allowing 3-4 parking spaces. VT Complete Streets Law requires not just consideration of walk and bike in any transportation investment, but “safe” accommodation! That one word safe almost orders safety/facility treatments like cycle track and roundabouts which cut serious and fatal injuries for both walk and bike modes by a substantial amount. Unlike signals and stop signs, a roundabout enables pedestrian movement as a priority with almost no delay and pedestrians deal with traffic traveling in only one direction at a time with the presence of a median treatment. Green New Deal--Climate change dictates two elements for the Winooski corridor: (a) use of roundabouts which cut climate change emissions about 30% at busy intersections; and (b) provision of active transportation, a must for built up urban areas/corridors. The Winooski Corridor is not primarily a through-corridor for bicycle and pedestrian transportation, but really a series of sections of street where the predominant role is to serve the trips of the neighborhood to and from substantial trip generators—mostly to, from, and via the Riverside-Marketplace and Pearl-Main related sections. Our design work take place in a nation and state which has systematically ignored safety a concern for streets and highways leading to the U.S. sinking from first to 20thsince 1990 with 22,000 excess deaths today compared to the fatality rates achieved by the top four nations including our once co-number one, the UK. Burlington in 2014 adopted one of the first “equality streets” plan, the North Avenue Corridor Plan, which converts key intersections from unsafe traffic signals to safe roundabout and provides cycle track from end to end. Safety achievements of other nations generally has begun through a comprehensive “systematic safety” plan and program ranging from licensing, education, enforcement and street design. Our design must reflect “best practices” for safety. Two issues emerged from the March 26 PAC meeting of significance: (1) questioning taking parking away from North Winooski, particularly along the mixed residential/commercial sections Riverside-Decatur/N. Union with its two-way traffic and Decatur/N. Union to North Street now southbound traffic only; and (2) a brief mention of cycle track (protected bike lane) placement at sidewalk level or a level midway between sidewalk and road level.